Companies can legitimately coattail and leverage credibility by delivering over time to a particular mission. Associations with these valued institutions enhance their brands. Employers can help to facilitate an increase in job satisfaction by deepening their employees’ held sense of efficacy beyond the “four walls” of the workplace environment. The company I work at, BlueBridge Networks, is committed to donating time, talent, and treasure to affect change in three key areas: economic development, economic parity, and healthcare. One institution we strongly support is the United Way of Greater Cleveland. Our United Way is one of the most efficient and prolific in the country as are our Catholic and Episcopal Dioceses and Jewish Community Federation. 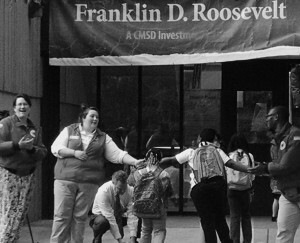 We have a strong Community culture of giving and participating fully in philanthropic action. On August 28, United Way launched the campaign by flipping and serving pancake breakfasts to 8,500 scholars in 17 Cleveland schools. I was able to be a small part of a special morning with BlueBridge Networks customers, United Way of Greater Cleveland President and CEO, Bill Kitson , his Executive Board Chair, Rick Buoncore of MAI Wealth Advisors , Managing Partner and CMSD Schools Superintendant, Eric Gordon. What a wonderful morning to help them help others along with Campaign Managers and a Team of committed and like minded Volunteers. I had the awesome privilege of helping to “kickoff” the Campaign flipping pancakes and serving and talking with the School children at a Cleveland Municipal School District. 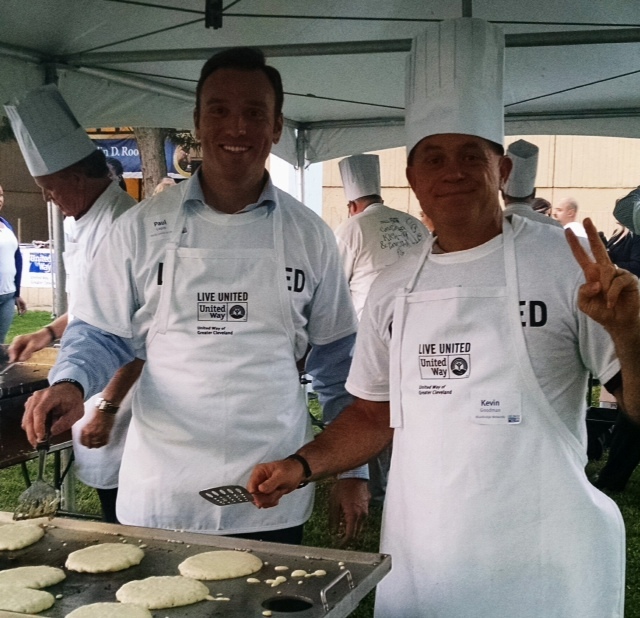 This year our Campaign Kickoff and Pancake Flip was different. I was at the FDR School. It was amazing to me that the children enter this school every day with enthusiastic and supportive adults greeting them with chant and cheer individually and in Community- not just for show for the kickoff. Its Principal, Mr. Hayes has an amazing leadership style with his children and with the Boys and Girls Club Campus on site, this school has amazing possibilities. It was a terrific experience to be out at the campus at this wrap around CMSD School. I was personally moved to a greater level in my desire to make the Mission of The United Way a reality by spending time with the children. As a member of the Northeast Ohio Regional Informational Technology Engagement (RITE) board, http://www.getithere.net/About+RITE/ We are honored to work with IT leaders such as Joe LaMantia , President of e-Ventus , Bill Blausey CIO, Eaton and other IT leaders to attract and retain IT talent in the region. When we started some years ago, there were 5,000 unfilled technology jobs in Northeast Ohio. Since then, we have significantly addressed the talent deficit by helping colleges and universities develop relevant programs and by committing to provide IT mentoring, internship, and employment opportunities. This is brain gain, not drain. It’s making a significant contribution to the region’s economy. The company I am privileged to be a partner at is “in the business of keeping businesses in business” and has, for nearly a decade, been a supporter in time, talent, and treasure to an organization that is “in the businesses of keeping everyone in business” — the American Red Cross. That organization’s mission of disaster preparedness and blood services has at one time or another personally or professionally touched all of us. This symbiotic relationship has allowed our employees to unify and inspire a sense of team and family by our longtime delivery to its mission. Last summer the Red Cross launched the Summer of Stories campaign to share the personal impact donors can have on patients in need and to help ensure a sufficient blood supply is available. Like me, many individuals have a story about how they learned the importance of blood and platelet donors. This entry was posted in Building Community and tagged Cleveland, corporate giving, partnership, volunteering. Bookmark the permalink.